As promised, I am posting details of my first real Arduino project - you know, after the "hello world" blinky lights and such. Although this does not stray much from blinking lights, except I will be "blinking" a solenoid valve every few hours to turn on the water. The 9V is there simply because the Fritzing program does not yet have an AC -> DC power transformer. The wiring, however, is the same. For this project, I purchased the transformer from Radio Shack and the pigtail adapter. Using a Fluke, I determined which wire was (-) and which was (+), and then connected those into the breadboard power module. 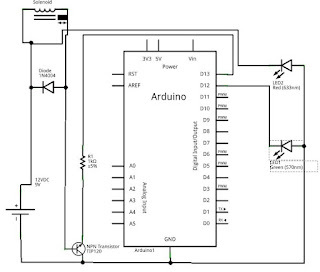 The power supply provides a source of power for both the solenoid and the Arduino board, so that I do not have to worry about a 9V battery going dead while I am not around to check on the garden. The green and red LEDs are mounted to the plastic enclosure (along with a power switch). The green is used to indicate if the solenoid is energized. 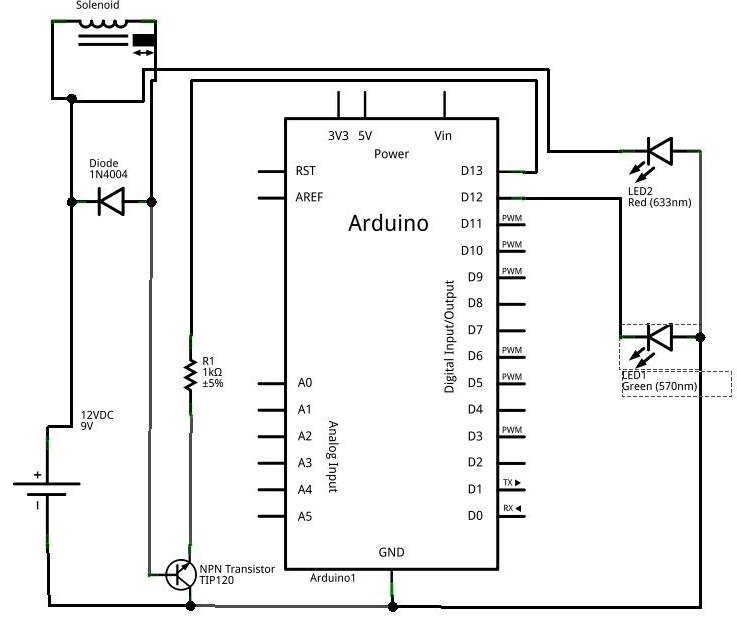 The red is used to indicate if the Arduino is energized. It actually only indicates if power is applied to the breadboard, but unless a wire becomes loose inside the enclosure, one could assume the Arduino is powered. The wiring schematic is a little bit easier to read. For the transistor on this one, the legs are BCE from top to bottom. There ya' have it! If there are any issues / problems / suggestions, please leave a comment below. Please note the threads! I almost ruined my connector by trying to pull off the plastic with pliers. 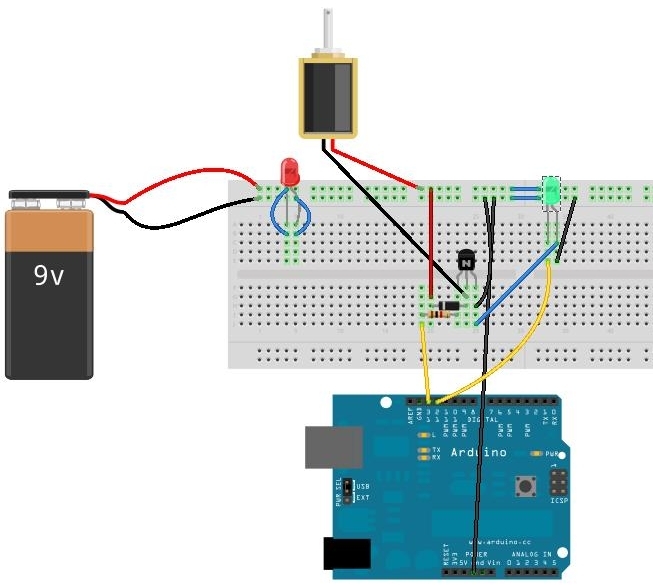 Purpose of the diode is to prevent buck voltage from going back through the transistor to the Arduino when the solenoid is deenergized. A good explanation of this phenomenon can be found here. Basically, when the current is flowing through the coils of the solenoid and then the power is removed, the current still wants to flow but has nowhere to go other than back through the transistor. Holes were drilled out for power cable, 2 LEDs, and switch. The switch is not shown in the schematic because it was an afterthought. Just run the positive wire from the power in to a leg of the switch, and another wire from the other leg to the breadboard positive. Yes, I know, these parts don't match those from the top of the post. I found out after assembling the female/female adapter that those threads were too deep to allow a seal because of the threads on the solenoid valve were slightly different. My solution was to use my garden hose female end (which has short threads) and put the female/female on the other end of the water hose, which then connects to the faucet. The stake is zip-tied to my re-purposed pallet.